Out of the bush at last and back to civilization as I know it. First, I want to thank God for a wonderful five weeks in the village. The allocation to the village was a perfect fit and I slipped right into the family culture. I give all glory and praise to the Father. I also want to thank you for your many prayers as I was immersed into the native culture of the people here in Papua New Guinea. I am a firm believer that prayer must be a priority in our daily lives. One of my daily prayers is Eph 6:18 ‘Never stop praying, especially for others. Stay alert and keep praying for God’s people’ (CEV). I believe through your faithful prayers, God sustained me and provided for me as He has promised he would. Thank you for covering me in prayer during the past five weeks. My brother has shared with me a passage that he has been holding strong to and I have also been mediating on the same passage. Ps 91 – The Lord is My Fortress. The Lord promises us safety from deadly diseases, dangers at night, and arrows during the day. God will command his angels to protect us wherever we go. The Lord says, ‘If you love me and truly know who I am, I will rescue you and keep you safe. When you are in trouble, call out to me. I will answer and be there to protect and honor you.’ Ps 91:14-15. Yes, if we call out to God he will answer and be there. What a comforting passage and reassurance that in fact He is the Great Shepherd. As I move forward and close this chapter of Pacific Orientation Course 2011, please be re-mindful of the words from the servant Paul. Continue to pray for me and the ministry of Pioneer Bible Translators. get a little rest before your next adventure. Yeah! Praise God for the completion of your time in the village. We are rejoicing with you. And, we’re curious about the face paint or coloring that you & Nelson both have on…? Peace to you, friend! 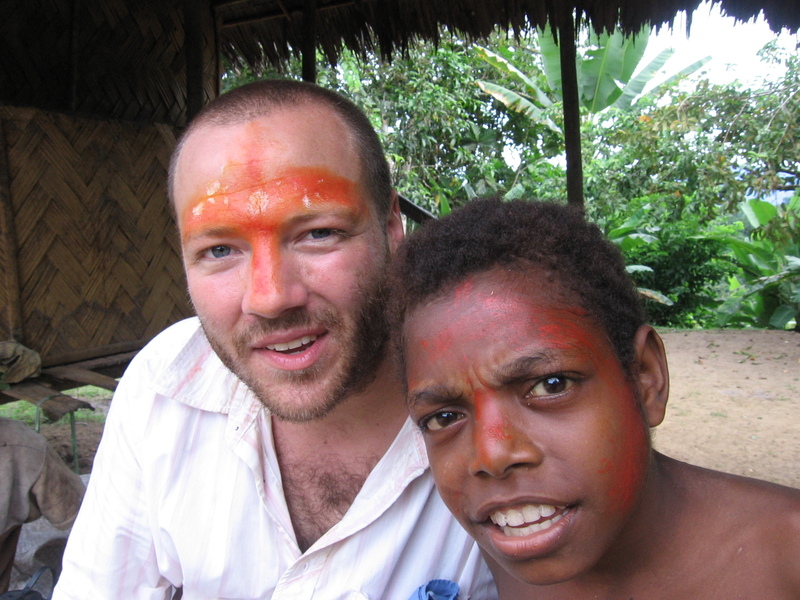 The face paint is just part of the cultural custom. When they celebrate with sing and dance they decorate themselves with paint, flowers, grass skirts, and feathers. This particular time I was coming home from church and we stopped in a neighboring village where the kids wanted to show me paint that is actually the seed of a flower. They put a cross on my forehead with spotted white shots. All the kids loved it and laughed. I will post more embarrassing traditional custom pictures of myself later.